PowerBook, iBook, iPod, and other portable computing is covered in The 'Book Review, and general Apple and Mac desktop news is covered in The Mac News Review. "When the words 'iPod killer' first appeared, my first reaction was to blush slightly, cutely bat my eyelashes and think 'How touching, these companies finally understood that Apple is on something' & Now, the exact same words tend to make me angry and puffy in a record-setting time - and that ain't a pretty sight. "My Economics 101 textbooks taught me that competition was the mother of innovation and the basis for a sound market. This, I am more or less ready to believe but we seem to have now left the competition zone to enter the obsession one, this dangerous area where, instead of wondering what customers need and how they could solve their problems, manufacturers focus on what the others already do - i.e. products that are already there, products from which only innovations and no breakthrough can come." "The iPod shuffle portable music player with Flash electrically erasable programmable read-only memory (EEPROM) was released by Apple Computer, Inc of the US in January 2005. It rapidly attracted attention for its low price: the 512MB version was available at only ¥10,980, while the 1GB version was available at ¥16,980. Cheap doesn't mean bad, however, in this case. We opened up the 512MB model together with an engineer from a Japanese universal serial bus (USB) memory manufacturer to find a host of uniquely Apple features. "Apple's care is obvious in the appearance of the components, and innovations to improve how the unit feels when you use it. The firm didn't hesitate to use expensive components when required." "It was a small packaging decision, but it touched off quite a debate. When Apple Computer Inc. announced a new line of its popular iPod digital media gadgets in February, the company decided not to include cables for the FireWire interface, also known as IEEE 1394. "Apple didn't drop FireWire support from iPods. The company simply stopped including a cable - worth around $10 - that came with previous iPod models. Consumers now have to buy the cable separately. However, a cable for the Universal Serial Bus (USB) interface still comes with the new iPods. That was enough to start speculation that FireWire is beginning to be pushed aside by USB's growing popularity. "That was probably an over-reaction. Apple's move may indicate that USB is gaining ground on FireWire as a preferred interface for iPods, but both USB and FireWire have a variety of uses...."
"A Canadian appeals court has temporarily blocked last year's ruling that overturned that country's 'iPod tax,' a fee collected on the sales of MP3 players that was distributed to copyright holders." "HP introduced new Media Center PCs with built-in iPod docking stations yesterday. "The m7000 series also features a special dock on the top of the PC that can be used to connect an iPod or an HP R-Series digital camera." "HP is to update its line-up of iPods to bring its range into line with Apple's latest players, and is to release the first PC with a built-in iPod dock holder. However, the company appears unlikely to follow Apple into either the iPod mini or flash-based iPod Shuffle markets, a move that some analysts have claimed will limit its future market share. At present, HP's range consists of two models, with capacities of 20GB and 40GB, neither of which color screens or photo capabilities. Since HP joined the iPod market, Apple has revamped its line up to increase the emphasis on iPod photo, which now accounts for two out of the three models in the main iPod range. 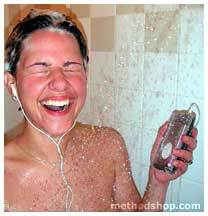 However, in January, then-CEO of HP, Carly Fiorina, committed the company to producing its own iPod photo. Although Fiorina's ousting will inevitably lead to some questioning of whether the company will continue in the iPod market, HP executives have since suggested that the company will be updating its range in the near future." "The first computer with a built-in spot for an iPod is on its way - and it's not a Mac. "Hewlett-Packard is planning to add a prime spot for Apple Computer's music player in its latest Media Center m7000 desktop PC. The computer doesn't have a dock itself, but rather features a molded piece of plastic that fits around Apple's own dock to allow the device to gracefully dock atop the PC. "The move raises the question of when consumers will see a similar feature on a Mac...."
There's no doubt the iPod has revolutionized the way we to listen music. People take their iPods everywhere with them and the smaller, lighter iPod mini makes music even more portable. On the run, in the car, or at the gym, our iPods have gone with us to the ends of the earth... except places near water. "Until recently, a short fall or a splash of water meant certain death for an iPod, but not anymore. Thanks to a company called OtterBox, makers of watertight storage cases for electronic equipment like PDAs, and GPS units, you can now safely take your iPod mini near or even underwater. 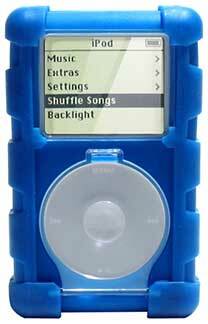 OtterBox has created a waterproof hard shell case they call the OtterBox for iPod Mini." "Mercedes-Benz USA is using Apple's iPod as a sales tool at this week's New York Auto Show at the Jacob Javits Convention Center in New York City. The automobile maker is providing 'walk-around' narrations about the features available on its new car models, as audiobook files installed on loaner iPods showgoers can borrow while they're looking at the new vehicles. Mercedes-Benz USA is also selling the audio books to showgoers who have brought their own iPods, and is selling them on the iTunes Music Store for US$2.95 each - iTunes has walkaround files listed for the 2006 CLS-Class and 2006 M-Class." "The Shuffle Songs feature randomly plays songs (skipping audiobooks) from your entire music collection. Shuffle Songs is available from the main menu on all iPods (except iPod shuffle) that have the latest version of iPod software installed. "You can also put your iPod in Shuffle mode all the time." 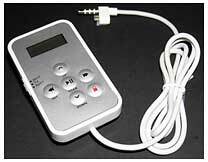 "Imagine recording studio-quality audio using your iPod and a regular-old microphone. Or sitting on the commuter train, playing Othello, Pong, Tetris or Asteroids. All this and more is possible when you install Linux on your 3rd generation or earlier iPod. Best of all, one soft-reset and you're back in Apple Computer's iPod operating system, listening to your tunes." "There is nothing worse in this universe that an Apple fan who can't immediately go out an buy the latest gadget that Apple has to offer. Sure if I didn't have a family, mortgage and car payments to make I'd be a hop, skip and jump to my nearest' dealer for my drug of choice - New technology. But alas it's not to be. So when the iPod came out I watched as all the other reindeer had the fun. Well that day is over I officially join the ranks of . . . 4th Generation iPod owner. "Okay so I'm late to the party but that doesn't mean there aren't advantages to that. I pay less and get more (5 GIG iPod is so 2 years ago!). Then again in 8 months time, mine will be old news and replaced by the holographic version. It's a vicious cycle. "So lets look at the Current iPod and how it's stacks up. Not as a brand new unit mind you, but has a few months of real world use beaten on it." "Battery Technology, Inc. (BTI) has officially announced the Tunestir, its new three-in-one iPod FM radio receiver, transmitter, and remote control. The Tunestir, which was announced at Macworld Expo in January, is the first accessory to be released that enables users to tune in and listen to FM radio stations on their iPod...."
PR: The SkinTight iPod Skin stretches over your iPod from the opening in the screen cutout. The included plastic spacer allows a perfect fit for every 4G iPod and iPod photo. The ToughSkin ruggedized iPod cover provides rugged protection and fashion for your iPod. Its one-of-a-kind design customizes the popular rubberized skin for extreme lifestyles. It's the only skin to feature ruggedized bumpers, screen protection, scroll wheel protection, and a detachable belt clip. If you're tough on your stuff, the ToughSkin is right for you. All Speck iPod Skins are made out of a superior shock-absorbing, tear-resistant KRATON plastic, which is easy to put on and will last a long time. They are made of Dynaflex, a strong, soft and rubbery polymer (plastic). Dynaflex feels nice and grippy in your hand and has no odor. The screen and clickwheel protectors are made of hard clear plastic. ToughSkins feature screen and clickwheel protectors- they are both totally removable and are made from hard, clear plastic. The 'ruggedized bumber' design of the case offers maximum protection from bumps, scratches, and yes- even protection from dropping your iPod. ToughSkins are available in five different colors: black, clear, red, orange, and blue. Removable plastic screen & scroll wheel protectors. Soft, tactile grip & feel. PR: AirClick is the remote control you've been missing. The Griffin AirClick for iPod and iPod mini lets you hook up your 'Pod to your sound system and wander through the house while in full control of your tunes. Pause your iPod to answer the door and then crank it up without even going in the room. AirClick USB is a remote for Mac and PC computers. The receiver module attaches to any available USB port (including hubs) and receives signal from up to 60 feet away. AirClick USB is ideal for controlling applications including iTunes, QuickTime, and even Keynote or PowerPoint. AirClick uses RF signals that travel through walls for control anywhere in your home or outside, up to 60 feet away. 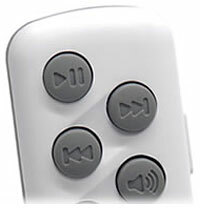 The five button remote allows for play/pause, next track, previous track, and volume up and down. A hold switch on the side prevents accidentally disturbing your musical nirvana. The remote has a clip on it for convenient attachment. iPod and iPod mini packages include a convenient remote holder with velcro straps to allow attachment as an armband or to a bicycle frame or steering wheel. AirClick - At home, in the car, or wherever you go, AirClick lets you take control of your iPod. AirClick mini - Why sacrifice style? This is the only remote control designed specifically for the iPod mini. AirClickUSB - Compatible with both Mac and Windows PCs, AirClickUSB can control applications like iTunes or PowerPoint from up to 60ft. away even through walls! AirClick Cradle - Use the included cradle to secure your remote in the car or on your bike, or use it as an armband for exercising. PR: With the iPod shuffle, Apple has provided music lovers with a whole new way of listening to their tunes while on the move. While traditional iPods are great, they are heavier and bulkier by comparison, and they have the distraction of their display. While you probably haven't heard many tout the lack of display as a benefit, we do. We prefer the simplicity of the shuffle's small and light-weight form factor because it offers new and exciting ways of carrying your music. After all, it's not hard to remember what five simple buttons do, and you never need to look at it since there's no screen. That's where the patent pending ShuffleMate comes in handy. 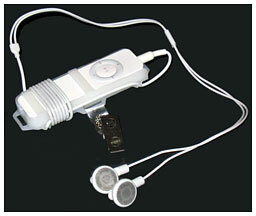 An iPod shuffle with the ShuffleMate allows users to wear their iPod where they could never imagine wearing it before. With excess wire properly contained and total package so compact and light-weight, you can wear it practically anywhere. Gone are the wires that get in your way or catch on everything. As great as the iPod shuffle is in terms of size and weight, it's useless without your ear buds. The ShuffleMate provides a fantastic way to keep the two together so you don't lose or forget them. Furthermore, you can easily remove the shuffle for synchronizing and charging without having to remove your ear buds from the ShuffleMate. The ShuffleMate case is made of a very sturdy polymer offering a protective exoskeleton for your iPod shuffle. The ShuffleMate is all about giving you options. It has a built-in clip that's perfect for belts or caps, but also comes with an industry standard "bull-dog" clip that can be attached to any side of the ShuffleMate via mounting slots. These slots accommodate a wide variety of alternative clips as well, such as retractable clips and custom lanyards. Show your team spirit by attaching ShuffleMate to a lanyard imprinted with your Alma Mater or favorite sports team. Get creative! Both clips are strong and durable - only a violent force will cause your ShuffleMate to "let go" of what it is clipped to, so it's great for running or working out. You can mount it out of your way, contain the excess cord, and go about your business without worrying about excess wire getting in your way. 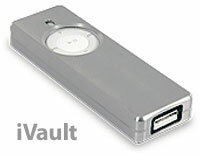 PR: Introducing the iVault, an aluminum case for the iPod Shuffle. Griffin, in collaboration with designer Greg Gutierrez, has created a stunning enclosure that incorporates maximum protection in an elegant design. Machined entirely out of aluminum, the iVault safely encloses your iPod Shuffle, while still allowing total access to the control wheel, audio jack, on switch, USB port, and LED. The front and back halves of the case are joined together by four small screws, so your iPod Shuffle is guaranteed to be secure. Lightweight yet strong, the iVault and the iPod Shuffle together weigh less than 1.5 ounces. The iVault also has it covered when it comes to style. Every edge of the iVault is rounded and beveled for the perfect feel. You won't want to put it down. 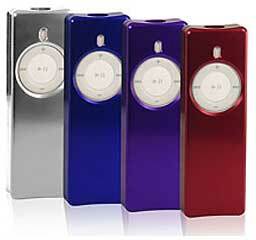 The iVault comes in four distinctive colors: silver, blue, red, and purple. Customize your iPod Shuffle in a way that will make iPod mini owners envious - and give it a suit of armor at the same time. The iVault is indeed a worthy companion to your iPod Shuffle and will ensure that it, and your music, is protected in style. You can order now for $29. PR: Unlike other iPod copy tools, iPod.iTunes provides real synchronization of MP3, AAC, Protected AAC, Audible tracks, and even playlists from your iPod(s) to your Mac(s). iPod.iTunes saves your time because it automatically only copies those tracks that are missing in the iTunes library, excluding duplicates. If you wish, it provides also an option to show a list of tracks which are not in iTunes and to copy only desired tracks from that list. Tracks and playlist entries can be synchronized together or separately. If the tracks on the iPod are already in the iTunes library and you only want the iPod playlists, you can use the playlist synchronization alone. For every track synchronization iPod.iTunes creates a date-and-time stamped iTunes playlist containing the tracks which were transferred. This gives the option to easily add those tracks to existing playlists or to create new playlists from the transferred tracks. Playlist Synchronization: Options to transfer the track Rating and/or Play Count. Track Synchronization: Fixed a possible problem with Audible files. The Tools tab contains a new function to delete playlists starting with a given string. This can be helpful to easily delete all playlists which where synchronized with a playlist prefix. Mac OS 10.3.x: iPod.iTunes does currently not work when FileVault is turned on. Mac/PC-formatted iPod with firmware 1.0 up to 4.0. Does currently not work with the iPod shuffle. iPod.iTunes is Euro 29.90 shareware. PR: Give your new iPod shuffle a new look in seconds and protect it from abuse at the same time with ShuffleArt Skins! 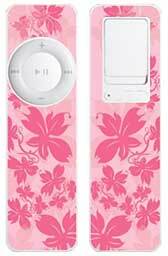 Check out this ready-to-apply iPod shuffle full-color skin with an ultra-high resolution full-color design printed on premium grade vinyl. All full-color skins are repositionable/removable/reusable for a fast, easy and accurate installation and goo-free removal! PR: YamiPod is a freeware application for manage your Apple iPod for Windows and Mac OS X. It can also help you to rebuild the music library in case some program messed up your iPod. PR: Looking for more sounds to feed the insatiable thirst of your iPod? Then get PlayPod and start browsing thousands of free radio shows, news shows, and other podcasts. PlayPod was designed exclusively for Mac OS X and contains a powerful download engine covered with a gorgeous Aqua interface. Keep your iPod contents dynamic with PlayPod. Integrates with iTunes. After you download a file, you can have it move automatically to iTunes, set genres, playlists, and convert to AAC bookmarkable files. Once a file is downloaded and in iTunes, sync with your iPod. Written entirely in Cocoa with a beautiful, unobtrusive user interface. Don't have time to read the news? Then use PlayPod's built in text-to-speech feature to convert your favorite blogs or news headlines to audio files. Have them automatically added to iTunes so you can listen to them on your iPod. We strongly recommend using voices by Cepstral. Previews. Checkout a podcast before downloading it with the built in previewer. Directory. New podcasts are springing up everywhere, use the built-in directory to find your interests. Styles. Customize how podcasts and news items are previewed. It comes with a few built in styles or use any style from NetNewsWire. Scheduled Downloads. Don't want to consume bandwidth during the day? Have PlayPod automatically download podcasts at a more convenient time. .Mac Support. Backup and restore your feeds to your .mac account. Podcasts and News. PlayPod also has a simple built-in RSS news reader/aggregator because podcast feeds come in a standard XML format. So you can use PlayPod to browse news items and podcasts! Podcasting, created by former MTV VJ Adam Curry, is a term that was devised as a crisp way to describe the technology used to push audio content from websites down to consumers of that content, who typically listen to it on their iPod (hence the "pod") or other audio player that supports mp3 at their convenience. The term podcasting is meant to rhyme with broadcasting and is a derivative of the iPod platform. While not directly associated with Apple's iPod device or iTunes music service, the company did contribute both the desire and the technology for this capability. Podcasting is not unlike time-shifted video software and devices like TiVo, which let you watch what you want when you want by recording and storing video, except that podcasting is used for audio and is currently free of charge. Note, however, that this technology can be used to push any kind of file, including software updates, pictures, and videos. Podcasting uses an XML-based technology called RSS, or Really Simple Syndication. Content publishers describe new content in an XML RSS file which includes dates, titles, descriptions, and links to MP3 files. Badge. Use our badge on your site and let people know you recommend that best iPodder software available for Mac OS X.